It turns out that tea does contain substances that have been linked to a lower risk for heart disease, cancer, and other health problems that affect men. But if you just don't like tea, take heart: Tea drinking alone will never come close to the most potent health promoter we know of—a healthy lifestyle. And coffee may provide a similar health boost (see "A healthy sip for java junkies, too"). "Tea consumption, especially green tea, may not be the magic bullet, but it can be incorporated in an overall healthy diet with whole grains, fish, fruits and vegetables, and less red and processed meat," says Qi Sun, assistant professor in the Department of Nutrition, Harvard School of Public Health. Tea contains certain substances linked to better health. The main players are chemicals called polyphenols, in particular catechins and epicatechins. "These are enriched in tea, especially green tea," Sun says. What do polyphenols do? For one thing, they are antioxidants. Antioxidants latch on to and neutralize chemicals called oxidants, which cells make as they go about their normal business. Elevated levels of oxidants can cause harm—for example, by attacking artery walls and contributing to cardiovascular disease. to experiments in rodents and test tubes, "the effect has not been substantiated," Sun says. Some of the best circumstantial evidence on tea and health has come from large, long-term studies of doctors and nurses based at the Harvard School of Public Health: the female Nurses' Health Study and the male Health Professionals Follow-up Study. As glucose rises in the blood, insulin shoots in from the pancreas to signal the cells to start metabolizing the glucose. Polyphenols seem to assist this process. "It makes cells more sensitive to insulin's effects," Sun says. 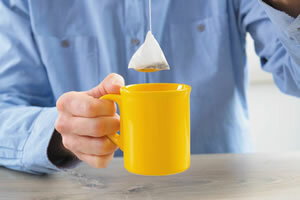 Some research suggests that tea drinking might be associated with lower risk of cardiovascular disease. That's consistent with the lower risk of diabetes, which contributes to heart disease and stroke. Also, substances in tea may help to lower blood pressure or improve cholesterol. associated with better health. However, it remains unclear whether the tea itself is the cause and, if so, how it works its magic. The studies attempt to rule out the possibility that tea drinkers simply live healthier lifestyles, but it's difficult to be sure. That said, tea itself appears to have no harmful effects except for a case of the jitters if you drink too much caffeinated brew. It fits in perfectly fine with a heart-healthy lifestyle. So if you drink tea, keep it up, but don't take up the habit thinking it will have a dramatic impact. But whatever you do, stay away from processed sugar-sweetened tea beverages and chai concoctions. These products may be loaded with extra calories, and consuming more than the occasional sweetened tea drink will tip you in the wrong direction. "If there are any health benefits to green tea consumption, it's probably completely offset by adding sugar," Sun says. 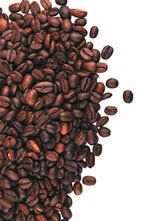 Coffee contains a complex mix of chemicals with known biological effects. As with tea, antioxidant and anti-inflammatory substances called polyphenols may account for coffee's purported health benefits. Animal studies suggest the polyphenol chlorogenic acid, which is abundant in coffee, could reduce risk of diabetes. Recent research pooled 36 studies involving over 1.2 million people and found that people who drank three to five cups of coffee per day had the lowest risk of heart attacks and strokes.